I’ve started digging on too many fronts so none are finished. The roughly dug squash bed is coming along well and hopefully there will be a woodchip delivery soon so I can make a couple of paths. I’ve bought some extra stakes and poles to make a munty frame* at the end, in the hope that all the Lazy Housewife beans come up. 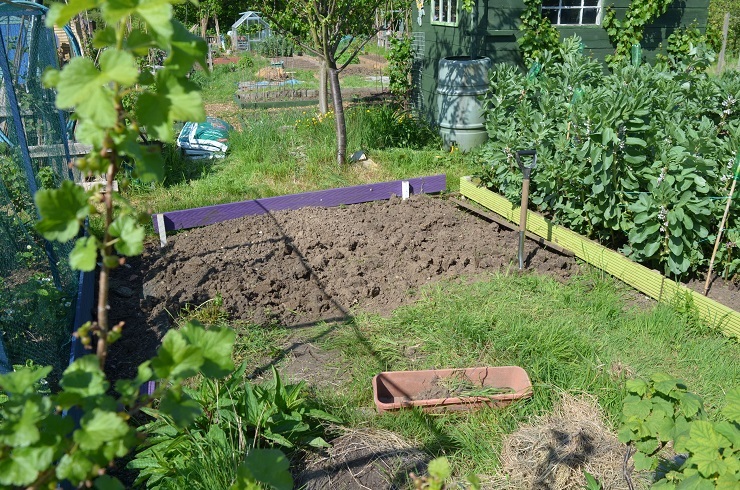 I can’t dig for long – working an allotment does help my fitness levels, and I do like having actual tiny biceps but my back can’t cope with much in the line of spade work. And besides, planting out is much more fun. 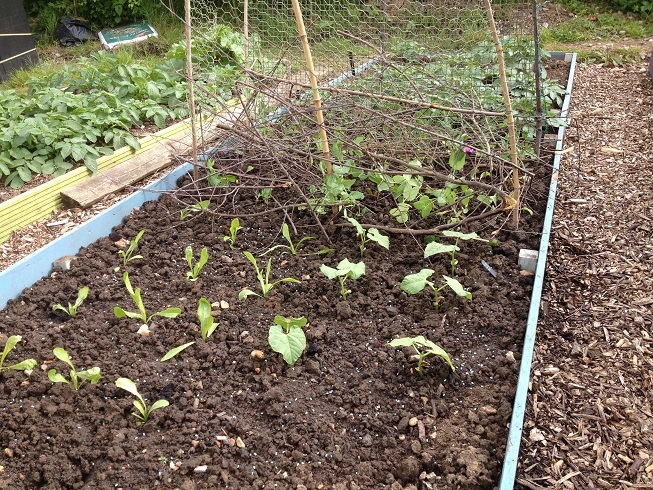 I now have chicory in, plus courgettes under a small tent, a few Vermont Cranberry DFB, a short double row of Detroit beetroot seedlings between the Kent Blue peas, and everything is covered in more spiky blackthorn twigs to keep the birds off. Sparrows treat my beetroot like it’s their favourite salad bar, so defences are essential if they are not to be battered. Still no parsnips, so I’ve resown and crossed my fingers. The salsify is huge though and there are flower buds forming. It’s hard to believe that there are only 5 roots in the tub. Katie and I started digging over the ground on #92 for a runner bean wigwam. She was surprisingly good at weeding and all my worms now have names. Obviously. 3 out of 5 cucumber seeds have come up so with mine we should also be fine for cucumber plants this year – unless another slug or snail finds its way into the greenhouse. Our AGM was yesterday aswell. After a very involved debate about fires & smoke which very nearly resulted in the creation of a bonfire warden, we’re getting a windsock so people can see when they should and should not have a bonfire. Am starting to feel the by now annual panic about being behind. *Small explanatory note: a Munty frame is a wonderful thing. Climbing beans and their supports can take up a lot of room. A Munty frees that space back up. It’s like a football goal, without net and instead with strings/twine that the plants use to climb up and over. You tie the twine to the top support, loop it over the lower rear support and bury the ends under the beans when you plant them out. This anchors the strings in position. 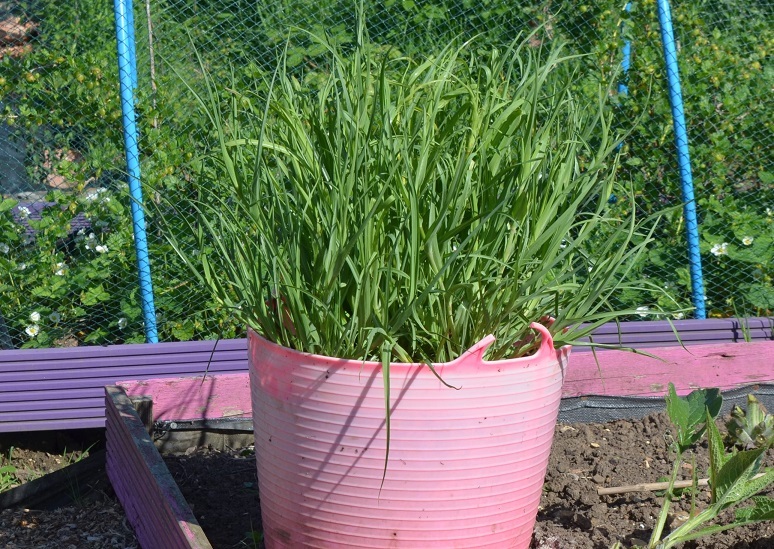 The higher end should face south and that gives a lovely sheltered bed for growing whatever you like, with beans hanging down clear of the foliage. A handy hint is to remember you still have to get under the frame to pick the beans, so leave room for feet! And that the crossbars need to be able to take a fair amount of weight as bean plants in full production are heavy.